Bright Future Global Tour's first Guatemala tour celebrates the Day of the Dead by participating one of Latin America's most unique festivals, the giant kites of Sumpango. Dia de los Muertos, the Day of the Dead, is a fiesta in which the dead are honored and invoked by decorating graveyards, making special food and participating in ceremonies. Sumpango Sacatepequez, a Kaqchikel Mayan village not far from Antiqua, Guatemala,honors the dead by decorating gravestones, playing marimba music and making special foods, but also through making and flying kites with prayers and messages for the dead. Among these kites are some as large as 50 feet, elaborate murals constructed of tissue paper, showcasing Mayan cultural themes. Kitemaking groups work for as long as 6 months on their unique kites. This fiesta represents a truly magnificent cultural tradition and an astonishing (and fragile) art form. Tour participants will visit Sumpango Sacatepequez before and during the Day of the Dead to meet the kitemakers and to learn more about this meaningful and beautiful tradition. The group will have an opportunity to create their own kite and will have an opportunity to remember and to honor our own dead through kites and ceremony. In addition, participants will stay with a host Guatemalan family during the festival and will have a unique opportunity to witness this beautiful and little-known celebration. 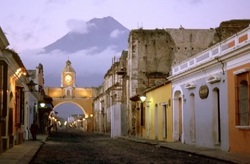 The tour begins in Antiqua, a beautiful and fascinating colonial city 30 miles from Guatemala City, well-located for cultural and scenic exploration. We will tour the city and nearby sites of interest, including a coffee farm, the La Azotea cultural museum, the museum of artenisia, the cathedral La Merced and the site of the Mayan "saint" San Simon (Maximon). The group will visit markets, experience Antigua's llively art scene, feast at some of Antigua's renowned restaurants and observe the preparations for Dia de los Muertos in and around this beautiful city. 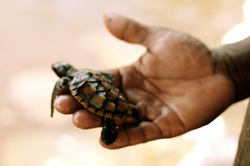 baby sea turtle and release the turtle near the sea in an affirmation of life and new beginnings. 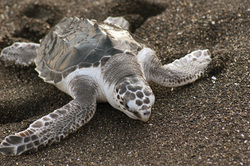 The warm climate and mellow seaside atmosphere of Monterrico are also conducive to kite flying, birdwatching and tours of the mangrove as well as relaxing by the swimming pool. 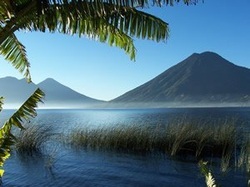 From Monterrico, the tour heads to Lake Atitlan, one of the most enchantingly beautiful lakes in the world. Participants will explore the extensive Mayan crafts in Panajachel, and tour some of the unique towns on the shores of Lake Atitlan by boat while learning more about Mayan culture, the Mayan calendar and the history of Guatemala. From Lake Atitlan, participants will be able to take a shuttle to Guatemala City to catch a flight home. Don't miss this unique opportunity to experience the rich cultural and environmental heritage of Guatemala and to see one of the world's most unique and meaningful art forms. *This year's donation from tour profits will support the kitemakers of Sumpango who spend their own money and donate massive hours of labor to create this fragile and magnificent art. ** The itinerary will be specifically updated as the tour dates draw closer. ***Occassionally circumstances beyond BFGT's control make keeping the exact itinerary unworkable. In this event BFGT provides alternative activities of comparable value for tour participants. Payments through Paypal. Fast, secure and you don't need to be a member of Paypal to use their service. * includes $75 non-refundable deposit (unless cancellation due to BFGT). Remainder of deposit refundable with 21 days notice, before the starting date of the tour or later if the tour fills despite the cancellation.